Pacheedaht First Nation declares support for a grassroots re-occupation of their traditional territory in the Walbran Valley, where Teal Jones logging company is clear-cutting the ancient cathedral forests around the park without consent. It takes a community to heal the land. Pacific Coast people have a long history of standing up for the places we love. In recent decades, thousands of Vancouver Islanders have come together to protect incredible old-growth forests from clearcut logging. It wasn’t easy then, and it won’t be easy now. The odds are against us. But our side is recruiting an army of peaceful resisters, and developing plans for strategic action to win back the Walbran. 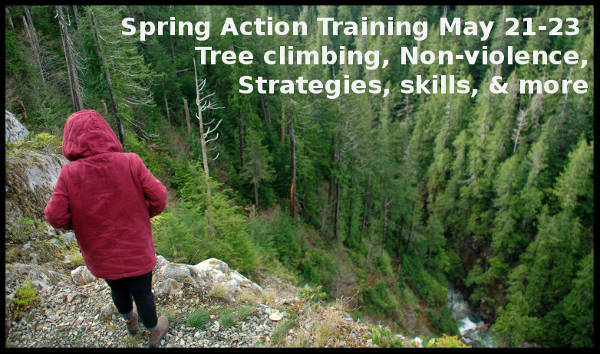 May 21 to 23, Forest Action Network and Women for the Walbran are presenting workshops on non-violent civil disobedience, tree climbing safety, fundraising, legal rights, and more. Meet like-minded forest protectors and learn from the most experienced campaigners on the island. Invest in a future of cathedral forests, wildlife, and spring-fed mountain streams. Tree-climbing is incredibly effective for occupying the forest canopy, documenting rare species and getting a birds-eye view of the logging, while staying well away from the loggers themselves. With our training, almost anyone can climb a 100-ft tree safely and easily using ropes and a harness. Non-violent direct action training is crucial for anyone who might come into contact with police, loggers, or protesters. This in-depth workshop uses role-playing to practice techniques for deescalating conflict. Please sign up or contribute today.